A basement that is lit up well can be a life saver! 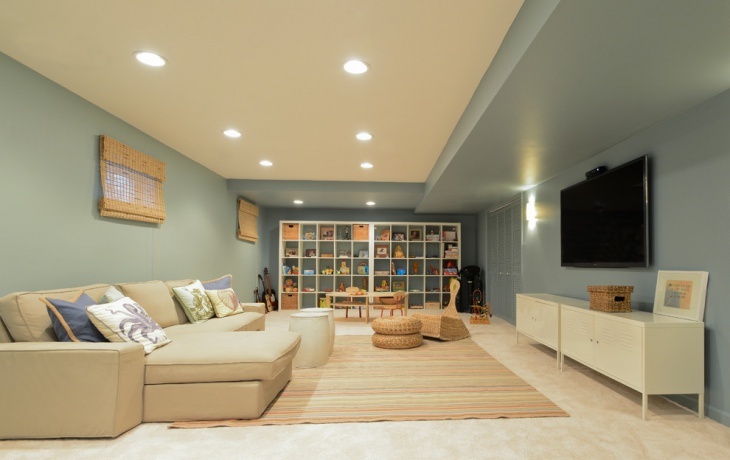 Basements are usually dark but with the right amount of lights and also the right type of lights, you can create a bright looking basement! 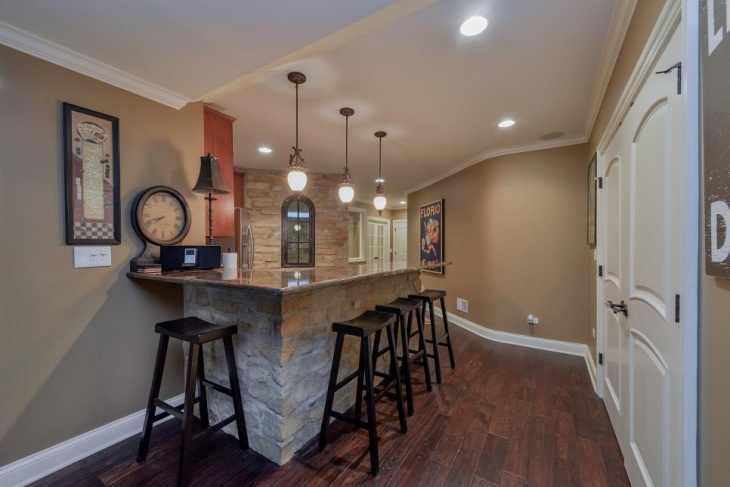 A well and good finished basement consists of some basic elements such as ambient, recessed, task and accent is crucial. 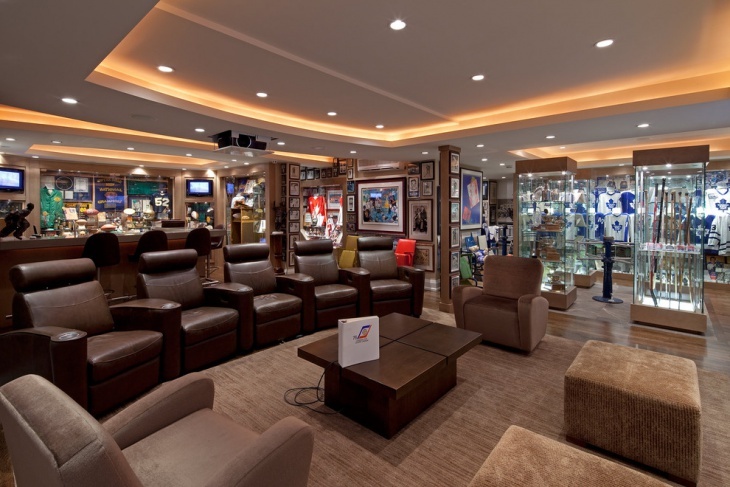 You could remodel your basement with the right lights and make it as good as new. 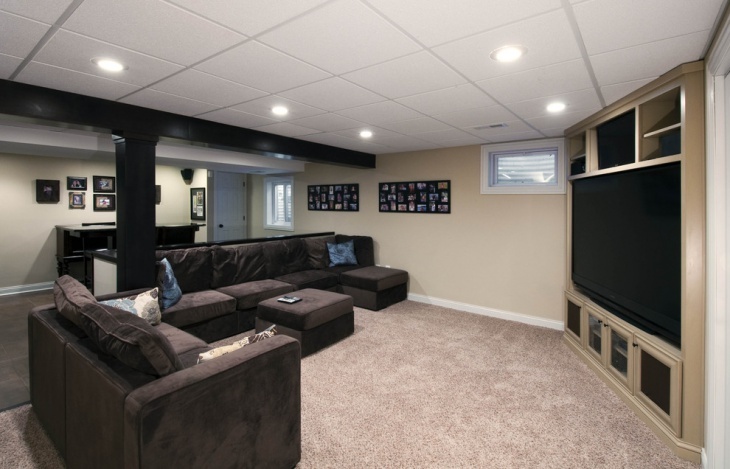 This basement family room has a traditional basement contains ceiling lighting which looks similar to focus lights. It also features a large pendant light that is placed in the center and along with that are tiny lights fixed in the ceiling. It gives a bright white shine. This is another traditional basement room which has track lighting which is small lights bordered around the ceiling. 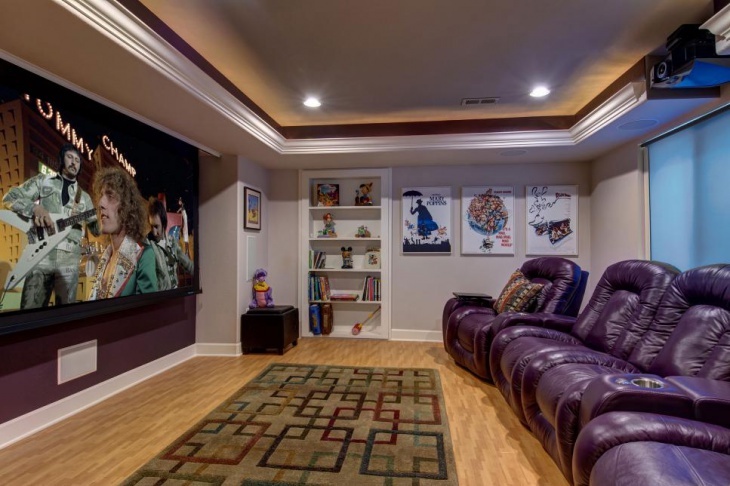 The room wall features wall collage with paintings, a round table with chairs, sofas, rugs that match with the rest of the décor of the room. This is a traditional transitional room in a cottage style house in the basement. The wall lighting idea here is unique. It features two lanterns like lights on the corners along with ceiling lights for a brighter glow inside the room. 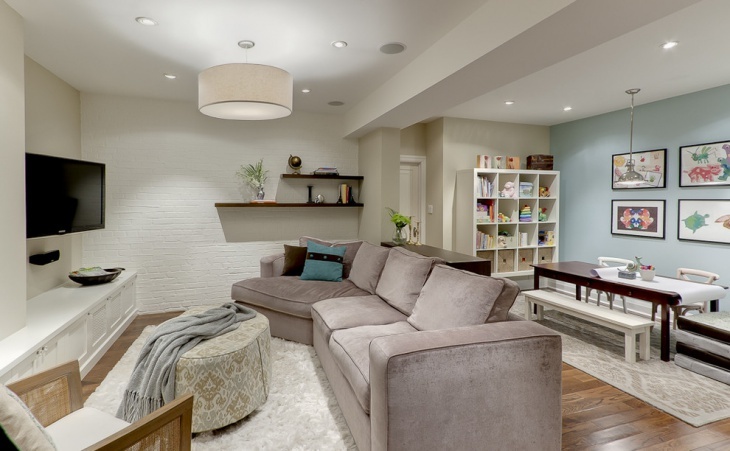 This is an industrial basement living room with an open concept and having recessed lights in a yellowish hue. The yellowish hue brightens up the room while maintaining the warmth and coziness. 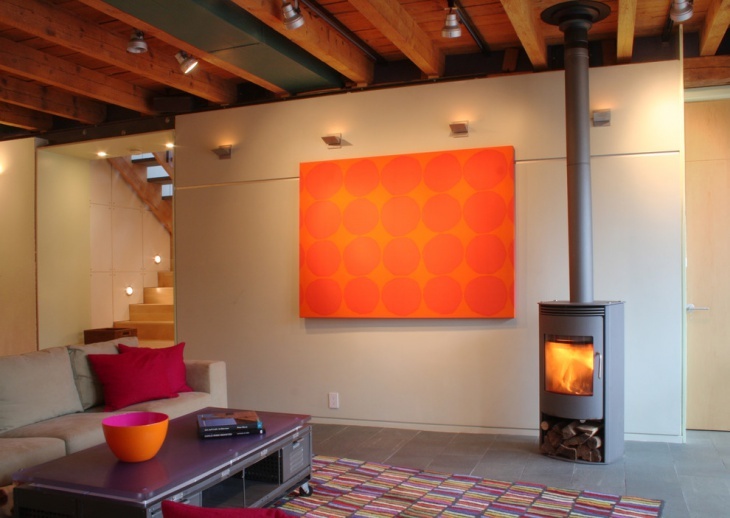 It features colorful décor that goes very well with the lighting effect. 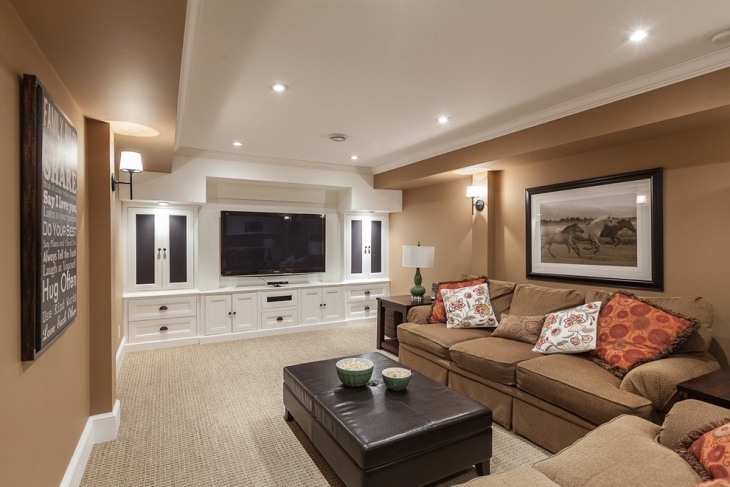 This traditional basement family room features pendant lights that hang from the ceiling. The lights are in round shape, has a white and yellowish tone. 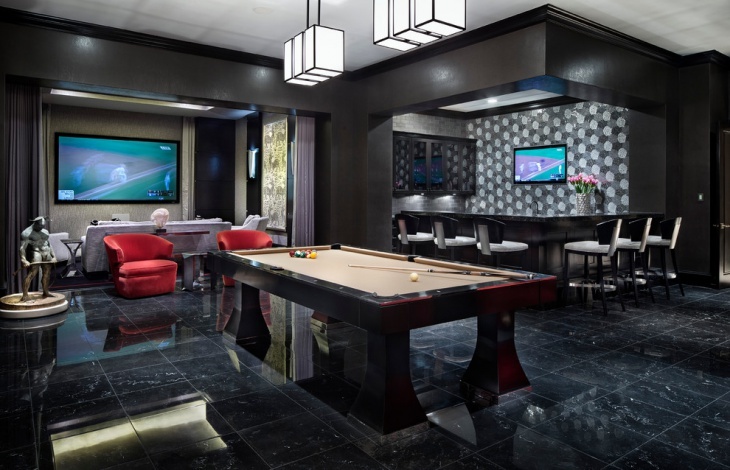 The lighting enhances the ambiance of the room. 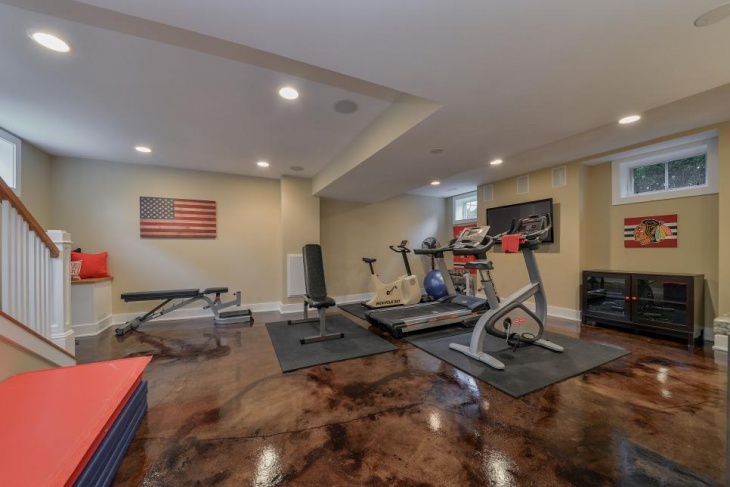 This is a beautiful basement room which is also very large and spacious. It has recessed ceiling lights which are tiny but abundant. The effect of these lights is splendid as it creates a wonderful tone and warmth in the room. 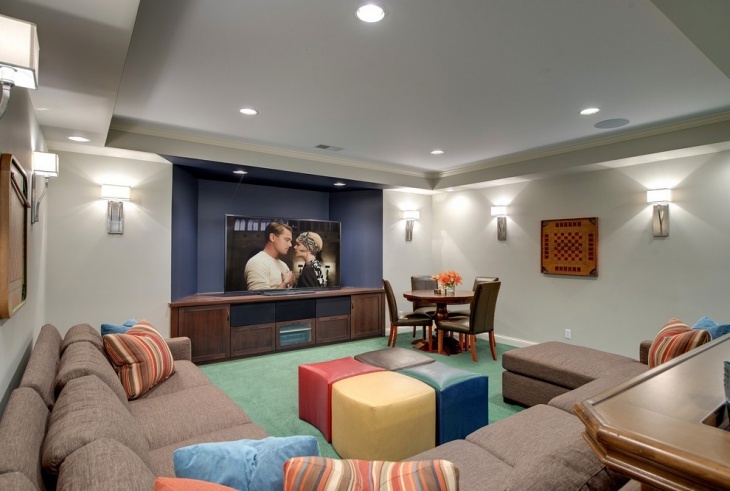 This is a basement home theater with a drop ceiling light effect which is very right for a home theater. A movie watching place has to be dark but not too dark. The proper lighting is required for it which is exactly what is there in this room. 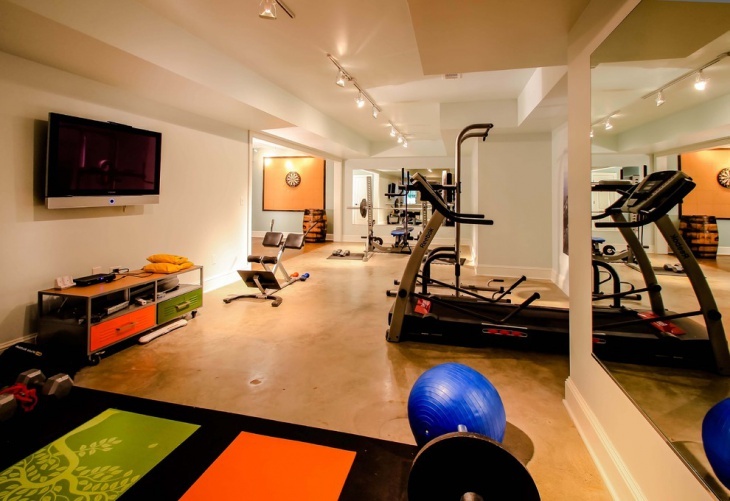 This is a basement gym where it has focus lights fixed in the ceiling. The light effect complements with the flooring which is a natural stone in brown that looks like granite. The lights are fixed at a reasonable distance from one another and are not in plenty. 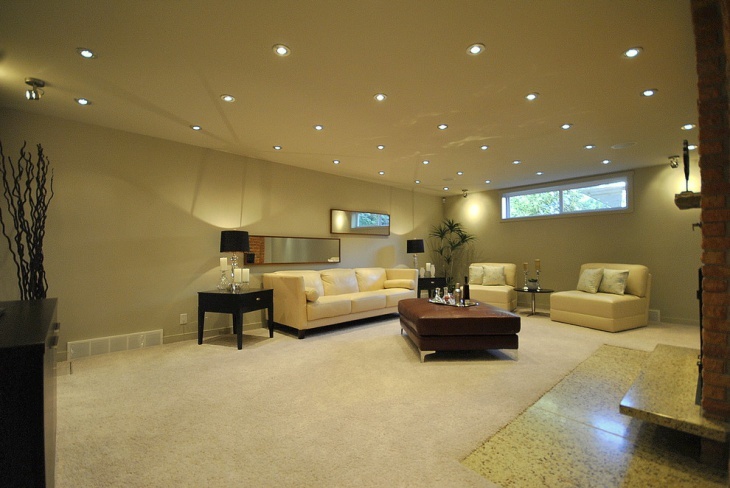 Basement lighting has to be done carefully since the basement rooms are generally a little dark and gloomy. 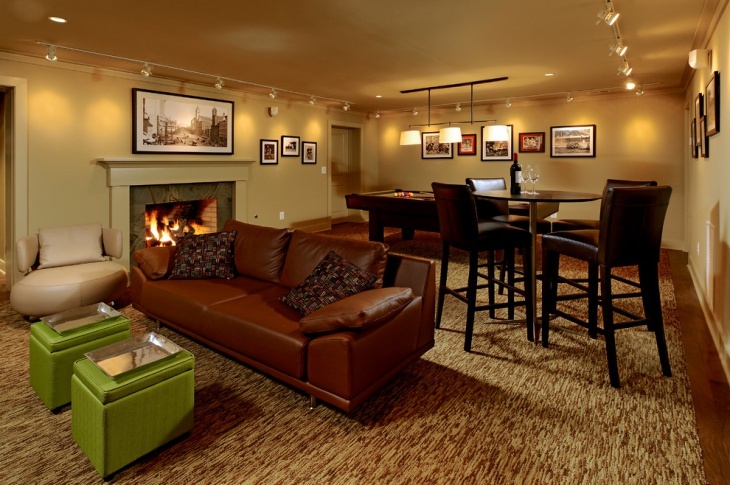 The right lighting can instantly enhance the mood and ambiance of any room. Hence, choosing good lighting is essential for a nice looking room. 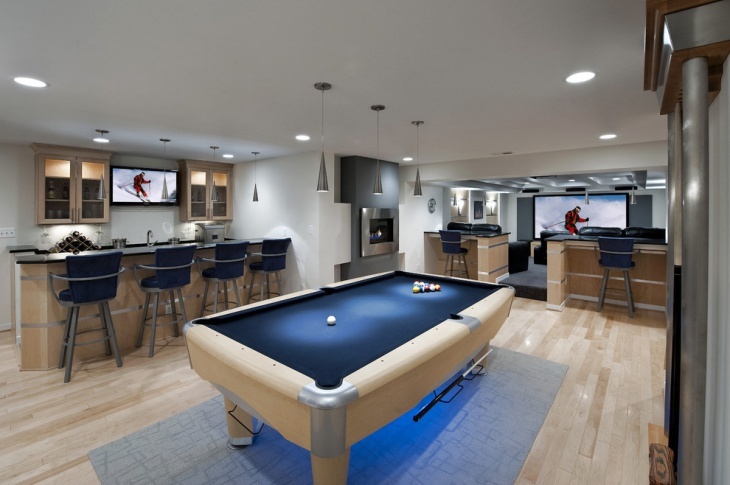 There are several kinds of lights that have to be incorporated depending on what type of room is being created in the basement. 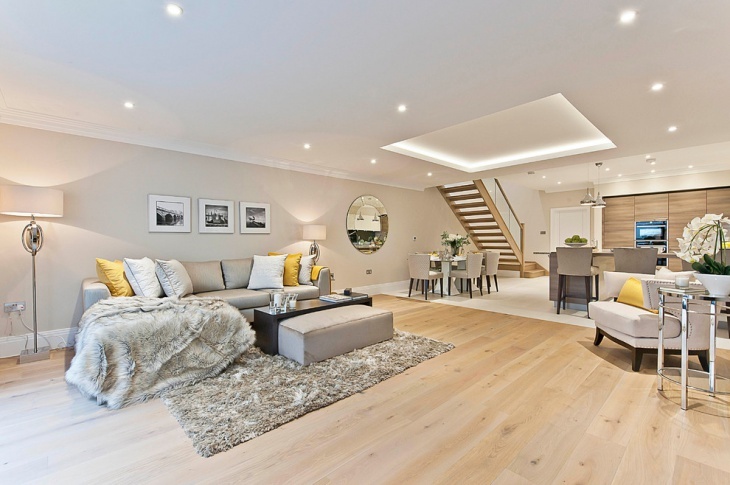 For example track lighting is also one of the very good options to consider as they do not occupy much space yet add a bright effect to the room.